When it comes to Paper 1 Section A, 3 really is the magic number (except when answering question 1 of course…). This simple message is helping my students to quantify exactly what they need to do for each of the questions. I also enjoy the spontaneous burst into song whenever I say the words ‘3 is the magic number’! Back in December I attended AQA’s Effective Exam Preparation course for the new English Language GCSE. It was a really informative day and has been instrumental in helping me to design how we prepare our year 10 students for their English Language exam this Summer (I will blog at some point about why we’re entering year 10s for English Language a year early). This is a post to share what I learnt and approaches to answering Paper 1 Section A which you may want to use in your own classroom. One of the best takeaways from the course was the idea to create booklets using SAMS4. Every student in year 10 now has a Paper 1 Booklet (Paper 2 to follow) that includes SAMS4 source material and questions along with exemplar essays and mark schemes. We then use metacognition lessons to: model exam strategy; model how to write answers; unpick the AOS and the mark scheme; mark exemplar answers and to make note of important reminders e.g. to read ALL of the information available to them on the question paper. The course leader shared some student friendly AOs which we have used to help us unpick the Assessment Objectives and make them more accessible for students. Once students have a good understanding of what skills are being tested it really informs their approach to different questions because they know which AO is being tested. We want ALL of our students to get 100% in this question – a message which we have repeated throughout the year. This question, testing AO1, is placed first to ease students into the paper and is, on the face of it, pretty straightforward. However, if we don’t teach this question well, it is very easy for students to make silly mistakes and lose marks. It is important that we consider how a student might make this question difficult for themselves and prevent these pitfalls. A useful activity, after looking at how to approach this question and then letting students select their four things, is looking at some seemingly plausible answers and discussing whether or not they think the examiner will award a mark. This helps students to, in the words of Jo Heathcote, understand how to ‘examiner proof’ their answers. On the source, put a highlighted box around the lines you are being asked to answer about (this may seem silly but we want to do what we can to ensure students don’t answer about the wrong bit of the text – it also highlights pretty quickly students who struggle with ‘getting’ what the numbers down the side of the text are). What is the focus of the question? What precisely are you being asked to select from the article? The key word is ‘List’ – there’s no need to waste time on inference. You might be able to say all sorts of interesting things about the significance of the colour of the bird but you won’t gain any marks by including them here… sorry! Use a pronoun at the start of every point e.g. It was black. Spend no more than 5 minutes answering this question and then move on. If it helps, put the time you need to move on by. We’re probably a bit more comfortable with this question than we might be some of the others on the paper (ahem… Q3) and it’s worth utilising our comfortability, and students’ natural inclination to make inferences, to build students’ confidence that they’ve got this – they’ve been doing this sort of thing for years! The AQA course leader made the point that this question is about making intelligent comments NOT identifying fancy techniques. Students can get top marks by exploring a word in depth – let’s not fall into the trap of over-complicating things. Ignore ‘could’ above the bullet points and replace with ‘should’ (with the caveat that sentence forms may or may not be the most useful bits of evidence to explore). 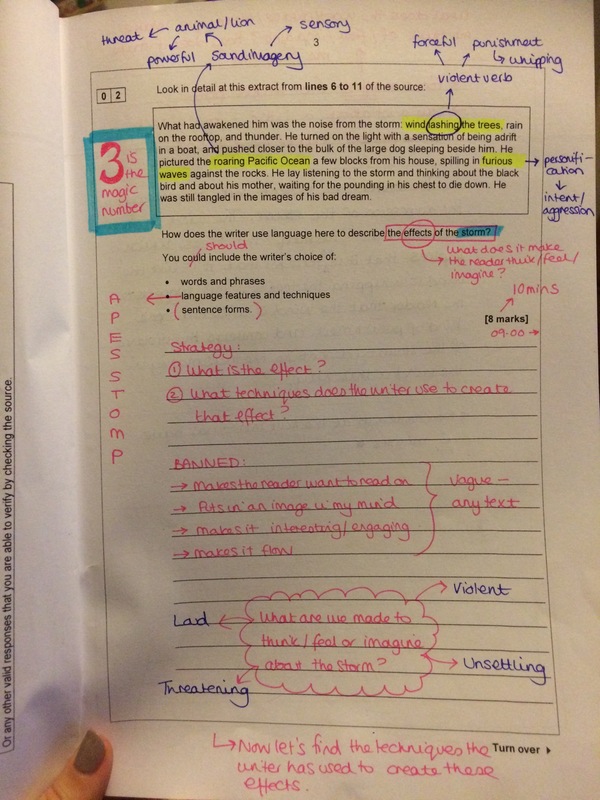 To write APES STOMP next to the bullet about ‘language features and techniques’ to remind yourself of SOME of the techniques that writers use (this is not an exhaustive list but a useful tool for lots of students and an acronym devised by Mrs KT @books4kooks). Think first: What is the effect? What are we being made to think, feel or imagine? Now think: How is the writer making me think, feel or imagine these things? Which words or phrases have they used to do this? 3 is the magic number. Identify 3 words or phrases that make you think, feel or imagine something in relation to the question. What effects do these words/phrases have? Can you identify any techniques the writer has used in your selections? Say a lot about a little. Spend no more than 10 minutes answering this question and then move on. There has been a lot of fuss about Q3 which I completely understand – I’m still getting my head around this one. Whilst I’ve seen fellow tweachers teaching their students terms such as anaphora, I don’t think this question demands that level of terminology (the AQA course leader said as much). Whilst we English teachers spent the last year fervently digging out fancy terms for analysing structure, the realisation has started to dawn that this question is much more about perspective and focus and movement (note my polysendetic list) than it is synecdoche, epizeuxis or chiasmus. I’m not saying we shouldn’t teach students this language of structural analysis, and there will be times when it’s illuminating, but we shouldn’t be overloading students with this stuff just because of this question (especially given that it’s not warranted). Where in a text is the source from? Why might this be significant? What does it tell us if this is taken from the beginning of a novel (for example)? Ignore ‘could’ and replace with ‘should’ – these bullet points should guide your answer. 3 is the magic number. You are going to write about three different ways in which the text is structured to interest you as a reader. Whose view is the text written from? What time? Where? What does the writer focus your attention on at the beginning (bullet one)? Why? In a word, summarise what each of the paragraphs are about – what do you notice about the focus of each? Where does it shift? What’s the effect? What else do you notice about the structure of the text? You might consider: connections and links across paragraphs; introductions and developments; reiterations; repetitions, threads, patterns, motifs; the sequence through the passage; narrative perspective; summaries and conclusions; outside to inside perspectives (vice versa) and movement from big to small (ideas/perspectives). If it is helpful, write the time that you will need to move on by. It’s very easy to over-complicated Question 4. If we boil it down, though, all students need to do is say how far they agree with the statement (from a limited scale of ‘a bit’ to ‘completely’) and explain why using evidence which they then explore. On the source, put a highlighted box around the lines you are being asked to answer about. You will likely AGREE with the statement that you have been given (though you may include one point about why you don’t entirely agree). What are your first impressions? Is Alex struggling to cope and how do we know he is? 3 is the magic number. Find three parts of the text that you can use to respond to the statement and write about them. Plan your response. How do each of those parts of the text show that Alex is struggling to cope? What techniques does the writer use? Do NOT include an introduction – this is a waste of time. Spend no more than 2o minutes on this question (unless you’ve gained time from other Section A questions) and then move on. You MUST leave 45 minutes for Question 5. If it helps, write when you need to move on by. I hope that proves helpful to other English teachers trying to wrestle with Paper 1 Section A though I suspect lots of it is familiar. If you have any questions or comments I’d be happy to respond. My post on Paper 2 Section A is here. NB: We use the SAMS material to create the booklets which you can find on the e-AQA secure key materials section (Insert – Question 1 – Question 1 Mark Scheme – Question 2 – Question 2 Mark Scheme – Question 2 Exemplars and so on). You can, however, download the booklet cover for Paper 1 here. This is an excellent approach. We have found annotated papers invaluable for A level and will now be using this idea for GCSE too. Thanks for sharing your ideas. This is so helpful. Thank you for sharing! Have you written something similar about your approach to paper 2 section A? Glad you enjoyed the course. I wrote it for AQA before finishing with them last year. Just my basic tips but lovely to see how you’ve developed them with your students. Thank you for this, lots of tips I have scribbled down. This is really useful thank you! Would you be willing to share the booklets you have made from SAMS4 for Paper 1/ 2? I would love to share this with my department.. students etc!! Are you on Twitter? DM me your email and I can forward to you. I’ve just followed you, Stuart. DM me your email. I haven’t been using Twitter or reading blogs for very long and it still blows me away how helpful everyone is! Thank you so much for this, as a newbie to teaching it has made things so much clearer! Can I be cheeky and ask for a copy of the booklets too? No problem Adam. If you’re on Twitter then you can DM me your email and I’ll send to you. What’s your Twitter handle? Can I also ask for a copy of your booklets for papers 1 and 2 or the link to them please? They are the SAMS on the AQA secure website. You should have access or you HoD will. Thank you. I will check this out when I have a moment. Hi – this is brilliant, thank you. Can anyone tell me what APES STOMP stands for – I can guess a lot of them but it would be nice to know! Hi Emma. I took the acronym from @books4kooks. Thank you so much for sharing this – it has been useful to use alongside tips I have been giving to our revision class students. Would you be so kind as to share your booklets? I think they’re a wonderful idea and will make ones for supplementary papers in the future, but simply son’t have the time between now and study leave…. Ruth do you have access to AQA secure area? The SAMS material is on there. You can also DM your email on Twitter if you want the cover sheets. So pleased the post has been helpful – the students really benefited from the modelling. Hi, I’ve just stumbled across this in desperation for materials for Year 11. Is there any way you could send across your booklets? I have spent hours scouring the AQA website for the sample materials and can’t find them! No worries if not. Do you have access to the secure key materials? It’s just one of the sample papers. However, if you send me your email I can send you what you need. That’s great – thanks. I can’t get into the secure area which is a nightmare! Email is gemma_stewart_1@hotmail.co.uk Thank you so much! Yes – will send tomorrow when home. Alternatively look in the secure part of the AQA website. This is brilliant – thank you so much for sharing. This is better than anything I’ve seen published in resource books. Would it be possible to have a copy of the booklet to share with my students, please? Many thanks. Thanks Lottie – sending now. This is really good. Is there any chance you could send me the booklet too? When I’m home I’ll add the covers to GoogleDrive but the booklets are SAMS and available on e-AQA. I’m not allowed to distribute. Sorry! Hi! Just come across this while looking at ideas for Y11 exam prep and love the idea of the booklets. I have the SAMS materials from AQA but wondered if you had a google drive link to the covers or the metacognition lessons you teach in conjunction with the booklets? Hi Hannah – I’ve just added a link to the covers. 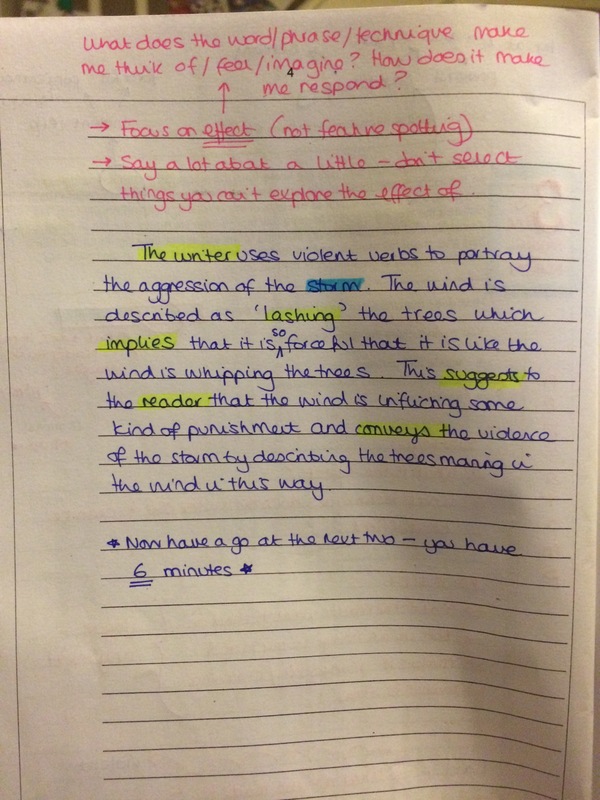 As for he metacognition lessons, we just talk through the approach in the post and annotate our copy using a visualiser. Sorry I can’t be more helpful!